It is true: most of the time it is sufficient to consider things based on readily available information and experiences. This is called WYSIATI — What You See Is All There Is. It means, you don’t consider what you don’t know. And indeed, usually it is not necessary. Yet, at times whole conceptions might shift once previously unnoticed details are added. The bothersome reality in the conversational realms of karate is that even tiny new details might demolish the ideological frameworks of others. This is the point where dispute frequently emerges. Because, who wants to start all over? Even karate’s various swarm intelligence collectives — from small dōjō to global organizations — have developed effective defence mechanisms to protect their half-timbers from too much shaking. 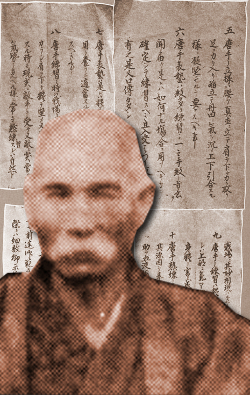 This article is about the following sentence once penned down by Itosu Ankō. Karate did not originate in Confucianism or Buddhism. The meaning of it can easily be explained: There are no religuous implications to Karate whatsoever. While this is good to go, there might be a slightly different perspective, too. In Japan the expression generally refers to the series of anti-Buddhist movements that occurred throughout the Meiji Era (1868 – 1912) and which aimed at the removal of all Buddhist influence from Shintō (shinbutsu bunri 神仏分離). Following the restoration of imperial rule on 9 November 1867, the haibutsu-kishaku of the Meiji era was caused by a number of government policies established by the new government. Most importantly, these included the “Order on the Separation of Buddhism and Shintōism (Shinbutsu Bunri-rei 神仏分離令, Shinbutsu Hanzen-rei 神仏判然令) proclaimed by the Grand Council of State (Dajōkan) on 5 April 1868. Moreover, it includes the imperial rescript of 3 February 1870 (Daikyō-senpu 大教宣布), i.e. the “religious-moral-political enlightenment” movement which defined the Emperor of Japan a godsend divinity and made Shintō the religion of state, thus redefining Imperial Japan a de facto theocracy. The movement was referred to as haibutsu-kishaku (abolish Buddha and destroy his Statues). Within the abolition of the syncretism of Shintō and Buddhism, the use of Buddhist statues and other objects of worship was prohibited and Buddhist elements eradicated from Shintō shrines. The movement saw the determination of certain shrines, the abolition and reorganization of Buddhist temples, the conversion of Buddhist priests to Shintō priests, the destruction Buddhist statues, images, and ritual implements, and the prohibition of Buddhist memorial services and the like. On 5 January 1871, the Grand Council of State proclaimed the order of confiscation of land owned by Temples and Shrines (Jisharyō Jōchirei 寺社領上知令), which exempted only the precincts itself. A small and not unified movement which opposed the events ceased already two or three years later, in 1871. The large Buddhist monastery with two towers situated within the pre-Buddhist Sumiyoshi Grand Shrine in Ōsaka was destroyed in 1873. The dining hall of the Kōfukuji 興福寺 in Nara was destroyed in 1875. At the “Three Mountains of Dewa” (Dewa Sanzan 出羽三山, i.e. Gassan, Yudono and Haguro Mountains) the haibutsu-kishaku began in 1874. Mount Nokogiri in southern Chiba Prefecture had 500 statues of Buddhist saints (arhat) who gathered after the death of Buddha for a convent (Gohyaku-rakan 五百羅漢像), which were all destroyed. Although they have been repaired, the scars of destruction remain on the statues. Moreover, the cemeteries of the hereditary peerage of the Empire of Japan (kazoku 華族) were also forced to change the Buddhist method to that of Shintō. At the Ise Grand Shrine, with the reigning emperor being its chief priest since the establishment of state Shintō in early Meiji, the abolition of Buddha and destruction of his statues was relentless: more than 100 Buddhist facilities once closely related to the Ise Shrine were destroyed. Particularly in Ujiyamada (in today’s Ise City), the number of Buddhist temples was reduced from nearly 300 to only 15. The Meiji government had designed Shintō at the nucleus of its national consolidation policy. Partly spearheaded by scholars of ancient Japanese literature and culture, and based on the argument that it was a foreign religion, Buddhism was stripped of its property, status, and a variety of other privileges it enjoyed until then. There are a huge number of other hair-raising examples, like Buddhist temples being crushed and sold as fire wood for a few yen. Or the thorough enforcement in the Satsuma fief, were 1616 Buddhist temples were destroyed and 2966 monks secularized: the confiscated temples’ territory as well as property and personnel were diverted to strengthen the military. For a true Buddhist believer, this must have been the ultimate abasement. So what Itosu Ankō might actually wanted to emphasize was probably not so much the refusal of Buddhist and Confucian influence on karate. Rather, his words might have been the implied postulation – in fact the fait accompli – of karate as a small wheel within the “religious-moral-political” trinity of the Daikyō-senpu 大教宣布. Karate, then, was permitted to exist and nurtured solely by the grace of Emperor and Shintō, and therefore the theocracy of Imperial Japan. If this is considered true for a second, how is karate – at least at the time of Itosu – not related to religion? This entry was posted in Unknown Ryukyu and tagged Itosu Anko, Karate did not originate in Confucianism or Buddhism. Bookmark the permalink.